When there are 6 strings and a sophisticated system of keys and buttons, a very special sound appears, creating the perfect combination of guitar harmonies and accordion melodies. The Lux Nova Duo performs a very diverse repertoire, emphasizing the Iberoamerican contemporary music . Recently, the duo has worked with young composers such as Pablo Carrascosa Llopis, Alvaro Zuñiga roncal and Martin Donoso Vera in the search of new sounds and expanding the repertoire of the guitar-accordion ensemble. 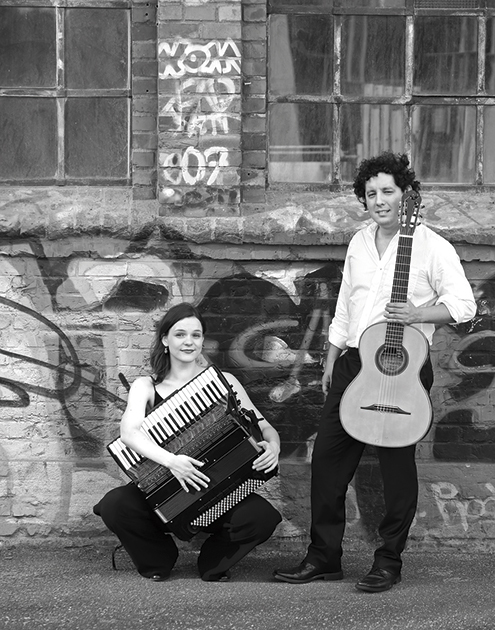 During the year, the duo has performed several concerts and festivals in Europe like the Elbphilharmonie Hamburg, Laeiszhalle Hamburg, the Festival Josep Soler (Catalunya) , Enrique Granados Auditorium(Lleida), Accordion Nordhom festival (Germany), Konzert für Akkordeon und Gitarre (Robert Schumann Saal- Zwickau Konservatorium), Forum Neue Musik Christianskirche Hamburg, Delta 15 Blankenese-Hamburgo, Schloss Bergedorf, Conciertos del mediodía (Auditorio de la facultad de derecho de la Universidad Catolica (Lima- Peru) y Tradición versus Vanguardia (Auditorio del Centro Cultural Peruano Norteamenriano, Lima-Peru).